Resource management tool application that assists aid workers in keeping track of the water requirement and intake of the communities they serve that have limited access to clean water. There is currently a difficulty with data collection regarding these efforts that prevents the creation of informed policies, like communities in Zambia, First Nation communities in Northen Canada, and even in urban settings like the Philippines or Sout & Central America. Canadian investors are being encouraged to invest in efforts that tackle nutrition, education, and clean water & sanitation. 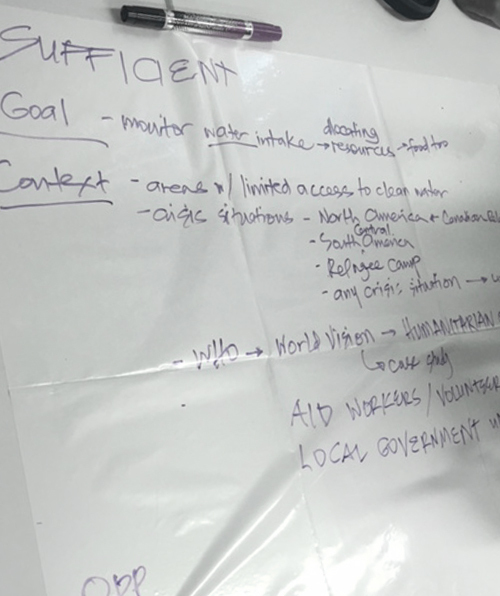 Sufficient aims to identify gaps in data in order for aid organizations to act upon. For example, a community or family that is currently being served and recorded by app still reflects worsening health conditions which leads aid workers to look into the situation and identify causes like family issues, corruption, or the involvement of oppressing forces. It also allows organizations to identify and prioritize service to areas with a more immediate requirement due to the overall health of the community. 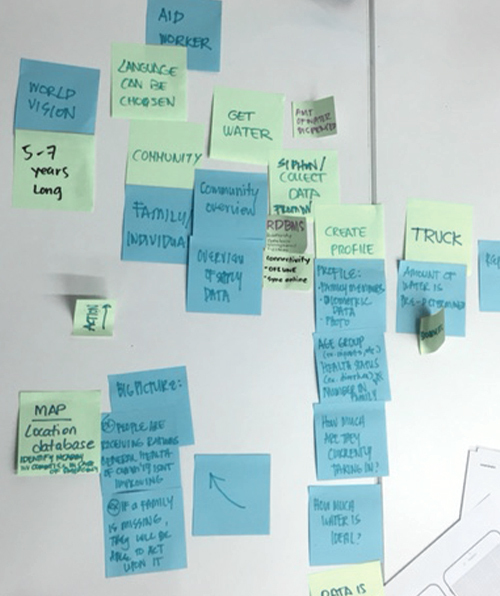 Ideation Process - It began with an affinity map to illustrate the current user journey and define the context of how humanitarian organizations go about distributing resources based on our conversations with members of World Vision. 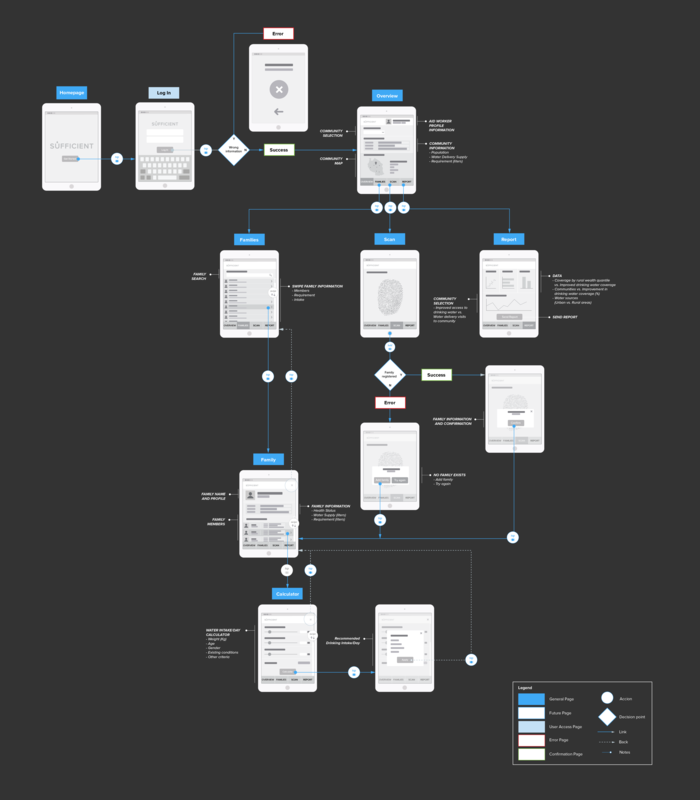 This map also revealed the concept for our initial user flow with regards to what information was needed to give an accurate diagnosis for each registered member. 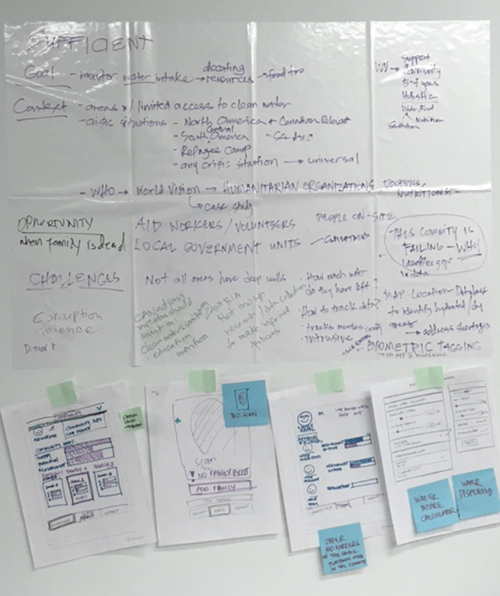 Scope - It was narrowed down to scenarios that occur between small communities and their assigned aid workers keeping in mind the existing databases that can be accessed thru the app. We mapped out the goals, context, opportunities and risks, and actions in response to this. 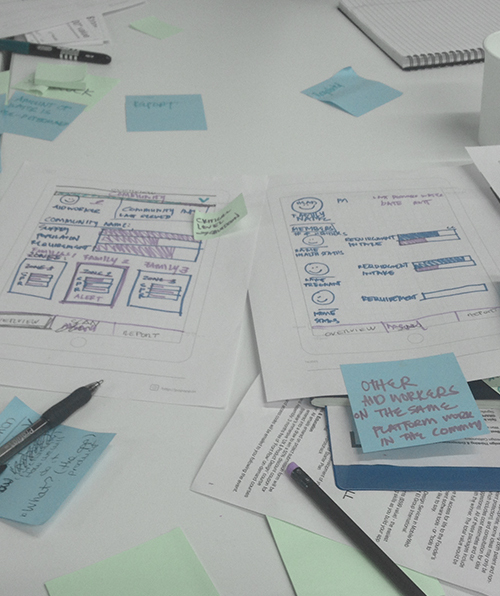 The rough wireframes created were then rendered to create the first prototype. Aid workers are assigned to a specific community to distribute water supply delivery on a regular basis. Members of the community are registered on to the system per family with an assessment of their health and record their fingerprints through the mobile device's built-in biometric scanner so members don't need a mobile device to interact with the system. Aid workers are able to update the health status of each member as they go about their rounds which affect the displayed water intake requirement on the app. The system updates the water dispensing unit which is fixed with a fingerprint scanner. It then dispenses the recommended amount of water per family (since not all members of the family are able to travel the distance from their homes). The system then tracks the last service date for each family and community. Sufficient is currently a work-in-progress that was created in under 7 hours at Protohack, a hackathon held at Bitmaker Labs in March 2016. This project was created in collaboration with Sisa Lleses, Alkarim Jadavji, KC Adviento, Shreya Shukla, Saabira Vanker, and Ahmed Al-Taha. The team is currently working on creating higher level overviews and identifying diagnostic criteria for the water intake requirement calculation.